Helping solve unmet needs in the market and creating innovative products around those needs drives the work we do at Glaro Inc. everyday. When we set out to develop our new line of sanitizing wipes dispensers, FDA approved wipes and coordinated receptacles, t was a result of conducting extensive research and receiving feedback from dealers and distributors. Our research surfaced common issues with existing products on the market. A general dissatisfaction with the quality and the representation of existing disinfecting wipes dispensers on the market combined with lackluster designs and usability issues were observed. While Glaro Inc. is not the first to manufacture commercial wipes dispensers, we are the first to actively make a better product that addresses known issues seen in other similar products. And, we manufacturer the entire line in the United States. Poor Stability – wipes stands with bases that wobble and are instable. Bases that were either too lightweight or in some cases dispensers absent of bases altogether. Flimsy Construction – surface wipes dispensers made from substandard materials or constructed in a manner that results in poor performance e.g. pulling a wipe and the entire cover coming off of the dispenser as a result. An Undesirable Appearance – stands that are generally hard to keep neat, clean, and streak free. 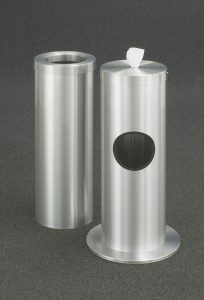 Commercial wipes stands or dispensers that “dispense” but do not offer an aesthetically pleasing appearance with finishes suitable for professional facilities. Limited Capacity – units that could dispense wipes but did not provide enough capacity to store used wipes, resulting in overflow and the need for constant janitorial attention. The ingenuity of the resulting product line lies in successfully identifying these known customer pain points and then improving the product’s design for a market already experiencing growing demand. Leveraging our 70 years of experience manufacturing commercial receptacles and products, we are pleased with the outcome and very thankful to the Glaro Inc. engineers, craftsmen and staff who have helped shape and launch the line to date. 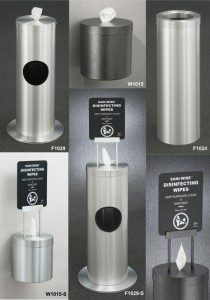 All Glaro Inc. wipes dispensers are available immediately for shipment to all dealers and distributors. Sales Team: Call 1-888-234-1050 to discuss the line and ask for pricing information. We are accepting new dealers at this time as well. Or email info@glaro.com.